We're sorry, but it is currently not possible to make reservations for this hotel. 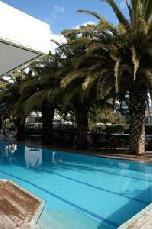 John's Hotel is a 4-star boutique hotel on the shore line of Athens. 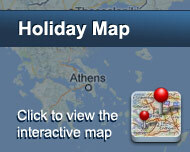 It is located in Glyfada, a suburb about 20 minutes south from the centre of Athens. The hotel is situated within a walking distance from the sea, the business district of Glyfada and one of Athen's largest shopping malls. For recreation, visit the tennis club or the golf club nearby. And after sundown, you will find a vibrating nightlife along the coastline. After the recent renovation the rooms have obtained a feeling of warmness and wellness with the use of wood in the floor and the furniture. Whether be a standard room or a suite you will mostly enjoy our popular mattresses and high pressure showers and our attentive room service. Our guests will enjoy views over the city and the sea from our spacious balconies. 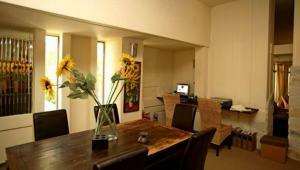 Business and pleasure are accommodated in our restaurants and bars. Our guests are offered to enjoy a relaxing and romancing dinner by the swimming pool or to unwind from a busy day away from the hassle by the fire place. Yet at the same time entertain the senses through the creations of our chef. You will also be presented with a wine list covering the most interesting wine regions of Greece available in all restaurants and in the 24 hour bar where the bottles are kept under ideal conditions. During the summer months (May to September) a pool bar is in full operation where you can enjoy a refreshing drink or a light snack. 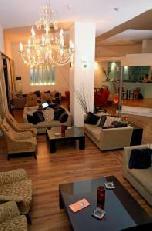 John's Hotel has the ability and the qualities to organize from a simple business to a medium scale conference. The Johns is functional at every level and can accommodate your Meeting in an informal or formal setting. Two rooms with unique characteristics and the capacity of 10 to 100 participants can in combination adapted to any need and demand. 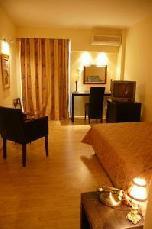 Both of the rooms are fully air conditioned and multifunctional with natural day light. 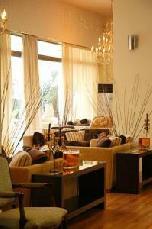 It is our pleasure to accommodate every request in order to offer a customized service to our clients. Facilities & Services: Restaurant, Bar, 24-hour Front Desk, Garden, Terrace, Non-smoking Rooms, Continental Breakfast, Rooms/Facilities for Disabled, Elevator, Express Check-in/Check-out, Safety Deposit Box, Valet Parking, Soundproofed Rooms, Design Hotel, Luggage Storage, Breakfast Buffet. Room Service, Meeting/Banquet Facilities, Business Centre, Laundry, Dry Cleaning, VIP Room Facilities, Breakfast in the Room, Ironing Service, Bridal Suite, Internet Services, Currency Exchange, Shoe Shine, Car Rental, Tour Desk, Fax/Photocopying, Free Wi-Fi Internet Access Included. Είστε ιδιοκτήτης ή διευθυντής στο JOHN'S; Εγγραφείτε τώρα για δωρεάν εργαλεία, που μπορείτε να χρησιμοποιήσετε για να βελτιώσετε την καταχώρησή σας και να συνδέσετε την ιστοσελίδα σας και το σύστημα κρατήσεών σας.